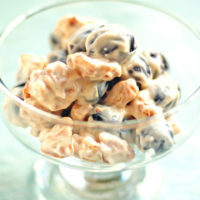 Okay, I wasn’t going to post this Grape and Walnut Salad Recipe, but last night when I sat down to take a bite–oh my! I just knew I had to tell everyone across the whole wide world to try it, at least once. It’s very basic, but quite honestly I’d eat it every day if I could. Believe me, this Grape and Walnut Salad is some pretty darn good stuff. And so very easy too, so no excuses. I’ve made this several times trying out different combinations along the way, so don’t get hung up on the measurements. Eyeballing it is just fine. And if you don’t like nuts, just leave them out. Add some toasted coconut or mini chocolate chips (or both) if you’d like. Of course, chocolate is always a good thing, right? So easy. Let me tell you how easy it is. These are the main players:. 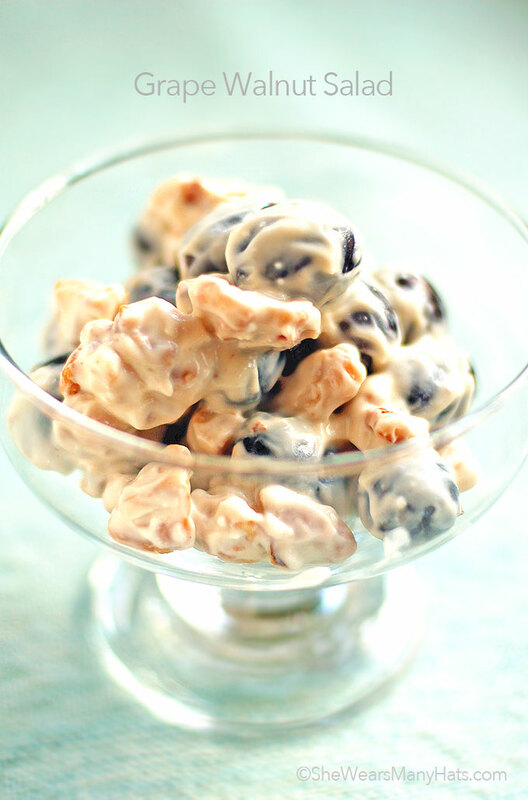 butter, walnuts, salt, cream cheese, vanilla yogurt, brown sugar and grapes. First prepare the walnuts (or pecans) by toasting them in a pan on medium to medium high heat in a little butter for about 3-4 minutes. You should just begin to smell them. Salt the walnuts lightly. A few pinches of salt should do it. Let the walnuts cool a little bit. Next, in a large bowl mix together the cream cheese and vanilla yogurt. I used a whisk (and a fork) to mash and mix by hand, but you could use certainly use your electric mixer or food processor. It doesn’t have to be perfect. Add the brown sugar and mix lightly. Then gently fold in the cooled toasted walnuts. Now, you could just stop there, because that’s all some mighty good stuff, but we need to keep going. We have to redeem this somehow by adding in something healthy, like grapes! Add the grapes and combine thoroughly. Make sure your grapes are dry or your salad will be runny. And no one likes a runny salad. If you need to pat the grapes dry with paper towels or a clean dish towel, take the time to do that first before adding to cream cheese mixture. If looking for ways to cut calories, substitute lower fat cream cheese and/or a lighter yogurt. I’ve used a combination of substitution and this salad turns out great every time. Plus, it’s your kitchen you use what you like! Green, red, purple … any type of seedless grape works just fine. Choose your favorite, or better yet, what’s on sale! Toasted walnuts are such a lovely addition to this salad, but pecans or another favorite nut could be substituted. If nut allergies are a concern, delete the nuts and consider adding roasted sunflower seeds, if they do not pose an allergy problem. A little bit of a nutty crunch rounds out this salad nicely. This Grape and Walnut Salad is the perfect answer for those sweet cravings, and a great option for adding to a luncheon or picnic menu. I hope you enjoy as much as we do. A perfect salad a desert or snack for serving at a luncheon or picnic. In a pan heat the butter over medium – medium high heat. Add the walnuts and salt, mix. Toast for 3-4 minutes stirring occasionally. Be careful not to burn. Usually when you can smell the nuts they are done. Remove from heat and let cool. 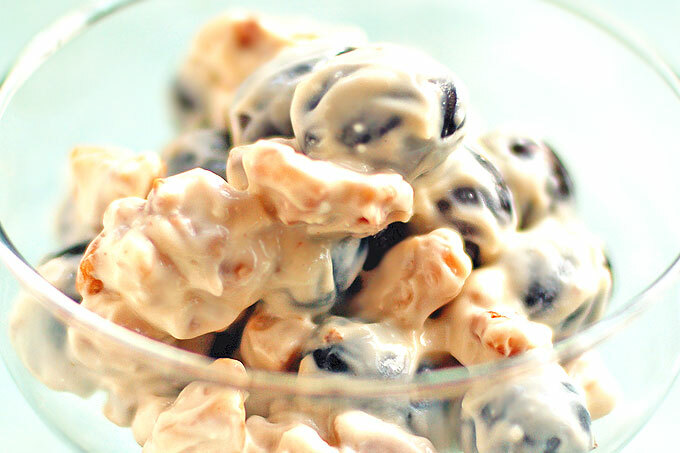 Combine cream cheese and yogurt. Stir in brown sugar, then cooled walnuts. Add mixture to grapes (again, make sure grapes are dry). You know, its not that it looks gross I just couldn’t tell what it was. But I will definitely try it. It is so yummy! I’ve had it before. Just a good dessert or salad. Isn’t it funny how some of the tastiest recipes aren’t so pretty to look at? I love this dish and am going to treat myself to it soon! I’ve never heard of this, but it sounds good! I’ll have to try it. This sounds amazing!!!!!!!! And so simple! I have heard of this being served and people fighting over the last serving. Who would have thunk it? I like the sound of a grape and cream cheese salad. Wow–I don’t think it looks so ugly…maybe it is the sound of it that makes it more yummy looking…whatever the case, it sounds heavenly! I dont think it looks gross at all. I wasn’t exactly sure what it was but now that I do know-it makes perfect sense and looks and sounds yummy.